Hello everyone!! i love this kind of posts because i get so excited about hunting fashion online and today i gathered some of the items i loved from Coco-Fashion, this store is greatness, i love the variety and the clothing are gorgeous, prices? to die for seriously incredible accessible prices. Here's a sneak peek of the beautifulness they have. What are your favorites? what would you wear this season? Hola a todos!! Amo este tipo de publicaciones, porque me encanta el ''fashion hunting'' en linea y hoy recopilé algunos de los artículos que más me gustaron de Coco-Fashion, esta tienda es una maravilla, amo su variedad y la ropa es hermosa, precios? para morirse, honestamente increíble lo accesible que son. Aqui les dejo un vistazo de las bellezas que ellos tienen. Cuales son tus favoritas? Que vestiras en esta estación? good choices, they have great stuff! sure! following you now ;) u have nice blog! If you want follow each other, follow me then I follow you back, OK? Ahora te empiezo a seguir con gusto, muy bonito a tu blog! The first dress is my favorite. The fringed denim shirt is awesome! ahhh love the bits you picked out! especially the white dresses! Hello! Thank you for passing on my blog. I follow you now on GFC (667). I like hunting for deals online too. Good choices! I have to say the top two pictures are my favorite! Hii:)) Thank you for your comment, I follow you now! :))) This is a great post and beautiful clothes! Oh lovely! I literally love every single outfit and those shoes are just gorgeous. Hi dear! Here i am to follow you back.. I like your blog..hope you can come back to mine soon! Hola, pues no conocía esta tienda pero la voy a visitar ahora mismo, me gustan mucho los vestidos. Everything here is gorgeous, great picks! We love your blog....thanks for coming to our!!!! Now we are new followers!!!! Such a fabulous selection, love the first two white dresses ! I want all those shirts, thats my go to for fall. I love creating a wishlist too!!! i love your blog too!! just followed you <3 stay in touch! Muchas gracias por pasar por mi blog y seguirme!! Ya te sigo (681)!! Aah looking good, love the items! Thank you so much for your comment, I'm following back on gfc, if you want we can follow also on facebook and bloglovin! I love the yellow neon set. Omgsh, I want them all! Those blue heels are perfect. Thanks for the follow btw, followed back! Wow qué outfits me encantan!! Como es la calidad de la ropa? Besitos! I love that denim shirt!!! I haven't heard of this brand before. They do some really nice stuff by the looks of it! I've never heard of CoCo fashion, but they have some cute things! I love coco clothes!! really nice blog, following, follow?? all stylish looks!!! great clothing!! You should go for one of the white dresses! Qué bonitas las prendas! Me gusta mucho la camisa roja! Hola acabo de llegar hasta tu blog navegando, me gustan la mayoria de los vestidos que nos muestras y la camisa vaquera de flecos es lo maximo! Si te parece para mi seria genial si nos siguieramos, de hecho yo me quedo por aqui desde ya acompañandote aqui en el blog y en instagram como (mimundodecolor) y en el resto de tus redes sociales *-*. Te espero en Mi Mundo un blog de moda, estilo de vida, tendencia, colores, manualidades, conceptos de fotografia y mucho mas. ¡Animate estare encantada de que estes alli! Love the blue heels! To die for! Que conjuntos más monos y variados !!! I love the third dress - so incredibly cute! All of the pieces are lovely. You're blog is absolutely gorgeous. :) I followed your blog on bloglovin & GFC and I'd love if you had some time to check out my blog as well. Beautiful stuff on your wishlist. Great post. I like your blog. Maybe you can visit my blog and follow me on gfc and bloglovin. What a beautiful blog! Thank you for your kind comment on mine, I'm following you now on Bloglovin! Nice blog you have...mind follow each other? 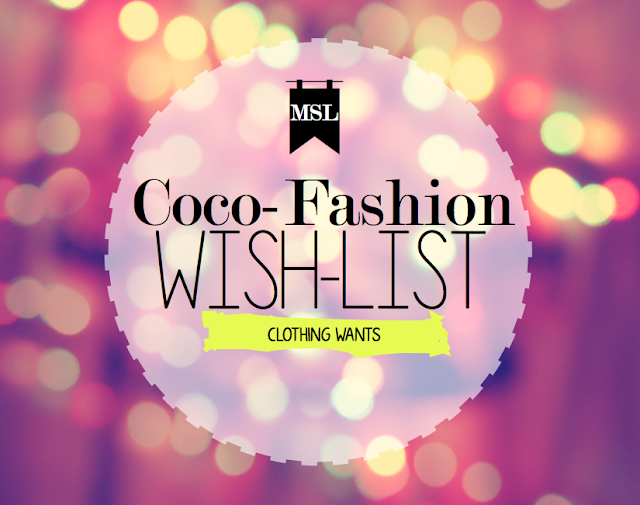 I love coco fashion - you picked out some great outfits! Hi, I follow you back! Adoro esas tiendas con ropa genial y a buenos precios!! lovely looks, so inspirational! i'm following you back on GFC, keep in touch!